Iowa State University had its beginnings in 1858 when the Iowa General Assembly established the Iowa Agricultural College and Model Farm. In 1864, when Iowa became the first state to adopt the Morrill Land Grant Act, the Iowa Agricultural College officially became the nation's first land grant college. Classes began in 1868 and the first commencement was held for 26 students in 1872. The 1868 fall classes were a college preparatory program. Formal classes began in March of 1869. Only two curricula were offered: Agriculture and Mechanic Arts. Research originated in Agriculture, with the first advanced degree granted in 1877. In 1870, outreach programs were being offered in various Iowa communities. The county extension concept was pioneered in Iowa and was formally established in 1903. "Iowa Agricultural College" became "Iowa State College of Agriculture and Mechanic Arts" in 1896 and then "Iowa State University of Science and Technology" in 1959. Land totaling 648 acres, for what is now the main campus of Iowa State University, was purchased in 1859. The University was to have simple beginnings as a "model farm" on that site. This farm was established in 1860, followed by the first barn and house construction in 1861. The site of the barn for beef and dairy cattle was the current location of Agronomy Building. The first house, restored in the early 1970s as the Farm House Museum, stands as a central campus historical site and museum. It was last occupied by Dean of Agriculture Floyd Andre in 1955. In 1861, the first Jersey cows were obtained by the farm. Ayrshires came soon after Jerseys. Although the year of introduction is not specifically recorded, Ayrshires from the farm were shown at the Iowa State Fair in 1869. Holsteins on the farm were first recorded via calving records in 1885. Guernseys were introduced to the college herd sometime shortly after 1908. Brown Swiss and Milking Shorthorns were introduced later, but specific dates have not been found. The Iowa Milking Shorthorn Society, through individual members, either started or reintroduced a herd at the college by donating five heifers in 1938. Over the years, breeds in the university herd have come and gone, but all six were represented early in history and continue to be important to the program. 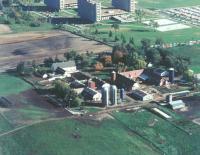 The College Dairy Farm, also known as the ISU Dairy, was established south of the campus on what is now known as Mortensen Road, on a 170-acre plot of land purchased in 1905. From 1861 to 1907, dairy cattle were housed in barns on the campus. The first dairy barn, North Barn, at the new farm was erected in 1907. That wooden main barn still stands immediately west of the manager's house on the north edge of the farm. These pictures were taken around 1916. The second generation of buildings included the current main barn. The original east wing of the main barn, the milkhouse, the feed storage barn, and all the coming winter's feed supply were destroyed by fire in October, 1935. No animals were lost. A special legislative session appropriated funds to quickly rebuild. Rebuilding of the east wing accompanied construction of an innovative system, a "milking parlor," completed in June, 1936. There is always pride in being first. The parlor at the ISU Dairy has been erroneously tabbed "the first in the state of Iowa" by many faculty and staff. It is true that it was designed and planned to be the first. But, the following record was uncovered in researching this article, possibly a quote from Professor C. Y. Cannon: "No other college had ever used this type of milking program before the Iowa State College barn was designed for it. One other state school (the Glenwood, Iowa, state hospital) was able to get a later similarly designed unit in operation before Iowa State College because they could build faster due to lighter construction and milder winter weather." But, the Glenwood facility closed down decades ago, while the ISU parlor is in operation. The parlor was built with many new technologies, including glass weigh-jars. Milk weights have been recorded through three generations of glass jars for every cow, every day since the completion of the original parlor. A half-ton ice machine kept the milk cans cool in those early days. Remodeling of a portion of the parlor from a side-opening four to a single eight herringbone occurred in the late 1970's. Photos of the milkroom and the farm in 1927 are shown. The west wing of the main barn was remodeled in 1955, followed by east wing remodeling in 1960. The maternity barn, west of the main barn, was originally a draft horse facility. The south half of the horse barn was modified to become a calving facility in 1939; the north half was remodeled for milking research cows in 1961. The calf barn/nutrition laboratory, west of the maternity barn, was built in 1955. Intricate surgical procedures to support research were developed in the nutrition laboratory, but recent changes in laboratory requirements have terminated surgery activities in this facility. In 1956 the old calf barn east of the main barn was remodeled into the current classroom building. Additional dates that mark notable changes at the ISU Dairy include 1943, when milking was rescheduled from three to two times a day; 1945, when artificial insemination was first put in practice; 1955, when a bulk tank installed; and 1956, when a glass pipeline installed. In fall 2003, in response to reductions in state allocations, the campus dairy was closed, bringing to an end, just four years short of the century mark, its service to the university and thousands of students of animal science. Plans are presently being prepared for the construction of a new dairy facility that will integrate the functions of both the campus and Ankeny dairy farms. When coursework began at the college, all agriculture students studied together under a general program combining science and practice. There were no deans or department heads at that time. The faculty and students were led by a professor in charge. The first "Professor of Practical Agriculture," Dr. Norton S. Townshend, was a medical doctor who had served as an army surgeon. Dr. Townshend had a strong interest in the pursuits of scientific agriculture. He was followed from 1869 to 1873 by Professor Isaac P. Roberts. Roberts taught "The Horse and the Hog" starting in 1872. From 1871 to 1873, College President Adonijah S. Welch taught a class in stockbreeding to second term sophomores. Roberts was followed as professor by Millikan Stalker, who left in 1879 to lead the new Veterinary Science program and eventually became its first Dean. "Essential Points of Dairy Cow" and "Best in Breeds and Crosses" were added in 1880 under the direction of Seaman Knapp, the new "Professor of Agriculture." In 1886 Knapp, who went on to become college president, was succeeded by Loren P. Smith. Smith soon ran into opposition from farmer groups for focusing too heavily on science. Smith left in 1889 and was replaced by a successful livestock breeder and farmer, James "Tama Jim" Wilson, who focused on practical training and formed units (later to become curricula) of faculty specialists in animal husbandry, dairying, and farm crops. Wilson became Dean of Agriculture in 1897. In 1896, Professor Charles F. Curtiss was appointed the first Professor of Animal Husbandry. Curtiss, pictured here on his horse, assumed a dual role as Dean of Agriculture in 1897 when Wilson was appointed US Secretary of Agriculture, and position he held for 16 years. The concept of separate curricula, and eventually formal departments, began near the end of the century under direction of Professor Curtiss. In 1897, curricula were listed for the first time in the college catalog. Options included: general agriculture, animal husbandry, dairying (most likely manufacturing), and horticulture. The Department of Animal Husbandry was listed in the 1898 catalog, with Curtiss as the first official department head. The first animal husbandry graduates were listed by unit in the 1904 commencement program. The Bachelor of Science fields that year were: animal husbandry, dairy industry, agronomy, horticulture and forestry. Dairy husbandry and poultry husbandry curricula were established within the department in 1914. From 1914 to 1946, dairy husbandry and poultry husbandry were listed as curricula options, within the Department of Animal Husbandry, for the junior and senior year; four-year status developed at a later date. In 1946, the Department of Poultry Husbandry was formed, however, dairy maintained its curriculum status. The name of the curriculum was changed to "dairy science" in 1962. Notable university figures have directed the dairy curriculum, including C.Y. Cannon (head of dairy husbandry from 1930 to 1951), Arthur R. Porter (who served as professor-in-charge from 1951 to 1968), and C.F. "Fred" Foreman (leader of the dairy science curriculum from 1968 to 1985). Agriculture faculty first occupied offices in Old Main, which was eventually destroyed by fire and replaced by Beardshear Hall. In 1880, agriculture faculty moved to the new North Hall, located south of the current site of the College of Family and Consumer Sciences. In 1892, the new Agricultural Hall (later called Old Botany, and renamed Carrie Chapman Catt Hall in 1988) became the home of agriculture faculty. In 1910, the animal husbandry faculty moved into a new home, Curtiss Hall (photo left). The dairy program was headquartered in 110 Curtiss; in 1953, it moved to 33 Curtiss. Research laboratories, which had been in Chemistry and Science I, moved to the north wing of the ground floor of Curtiss. In 1964, Kildee Hall was completed as the new home of the Department of Animal Science. The dairy science curriculum has occupied suite 123 in Kildee since 1965.